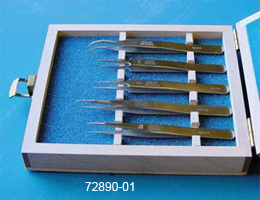 Dumont tweezers in a fine wood display case. 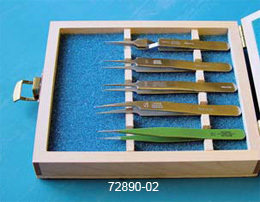 .This set includes one each of : style #3C epoxy coated (72682-D), Style 5A (72720-D), style 5/45 (72703-D), style 5AC (72730-D) and style N5AC (72856-D). Made from lightweight plastic and padded with protective foam inside, this tweezers storage box offers you the safe place to store your delicate and valuable tweezers, but keeps them at your reach when you need them.